Many of our residents and visitors are big fans of Yorkshire food and enjoy buying delicious local produce. Our holiday parks are located near a vast array of popular farm shops so whether it is shopping for seasonal ingredients or stopping for a spot of lunch, you are in for a treat. Here are six of our favourites. Housed in 19th century stables, Roots is a ‘social hub’ of activity offering a wide selection of fantastic local produce. Shoppers will discover all sorts of local fayre including fresh fruit and vegetables, Veterans Artisan Bread, local preserves, a wide range of Yorkshire and British cheeses, in-house bakery goodies, wine, beer and much more. In the Roots Café kitchen, they produce their very own scones, quiches, cakes, pork pies, sausage rolls, mince and onion pie, and the famous steak and local ale pie. Other popular choices are the afternoon tea or Sunday roast with veg and homemade Yorkshire puds. This family business based at Spring House Farm is situated on the A684 Northallerton to Bedale road. With 90 per cent of products sourced locally within North Yorkshire, you will find quality ingredients including meat, dairy and pastries. Enjoy delicious dishes in the Farm Shop café where everything offered is baked fresh by sisters Judith and Carol, who have a wealth of baking knowledge. The signature dish is called the Spring House Farm Shop Special. This includes Masham sausage, Arthur Haigh award-winning black pudding and Gloucester Old Spot dry-cured bacon from Taste Traditions of Thirsk, topped off with a fried egg from Ian Taylor. Delicious! It’s all about local produce here, and the shelves and counters are brimming with a wonderful selection of foods and ingredients. With an award-winning butchery section offering high-quality meat from J C Lister Farms, along with a delicatessen offering a fantastic choice of Yorkshire produce, you really will be spoilt for choice. The café is very popular serving up homemade quiches, pies and sausage rolls, and did we mention the award-winning Yorkshire breakfast? There are also home-made soups, salad platters and bacon, sausage or steak and onion sandwiches. Then there is the tempting selection of homemade cakes, cupcakes and traybakes – hard to resist! In the summer months, the outdoor play area for children is open and there are plenty of picnic benches where you can enjoy a coffee or lunch while the children play. A popular destination when enjoying a day out in the Yorkshire Dales, Mackenzies Smokehouse in Blubberhouses is a lovely place to stop for lunch or a wander around the shop. There is a strong emphasis on using Yorkshire ingredients and the café serves hearty sandwiches, sharing boards and great new dishes which go up on the specials board every week. The shop offers a wide range of fresh foods including Yorkshire Baker pies and sausage rolls and, of course, Mackenzies’ own range of smoked foods. Run and championed by the Yorkshire Agricultural Society and located at the Great Yorkshire Showground, Fodder is ‘passionate about Yorkshire, its farmers and local producers’. The shelves are packed with food and drink from 350 farmers and producers, with 85 per cent of what is sold and served coming from Yorkshire. The Food Hall sells delicious cakes, fruit and veg, and has an outstanding butchers and deli laden with fresh pies, cooked meats and an amazing array of cheeses. The café uses local ingredients of the highest quality and is very popular for breakfast, lunch or a lovely afternoon tea. Quality local produce is at the heart of this lovely farm shop which opened its first premises in 2000. The shop features a traditional butchery, bakery, deli and grocers, and offers outside catering for events and weddings. The on-site coffee shop is popular with locals and visitors alike, with the menu including all-day breakfasts, hot steak sandwiches, freshly made scones and toasted tea cakes. The farm shop’s very own baker, Sean, uses traditional methods to create delicious breads, pies, quiches, cakes and puddings. In the shop itself, you will find locally-produced meat, seasonal fruit and veg, Yorkshire and British cheeses and, of course, the lovely home-made baked goods we mentioned earlier. 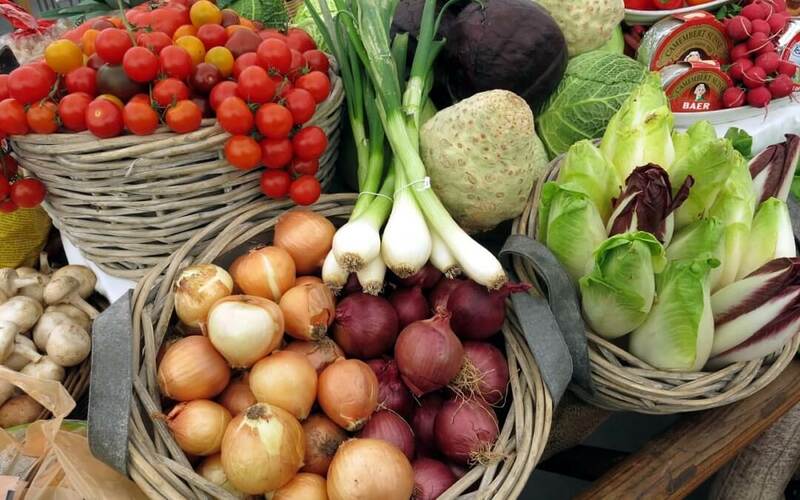 If you love local produce, why not also visit some of the area’s farmers markets? Find out more in our blog about market towns in North Yorkshire.